Manufactured for Hangerworld. Trust the Hanger Experts. At Hangerworld we care about the clothes you love. This website and the information and material which it contains are subject to change without notice. These Harbour Housewares Coat Hangers are beautifully manufactured with a sleek painted finish you can't go wrong. 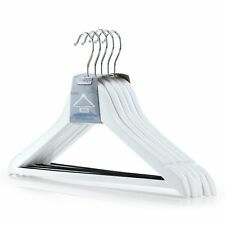 Multi functional hanger can be used for, suits, shirts, trousers and dresses. Available in a variety of colours, why not mix it up and order a selection of colours. Keep your little ones wardrobe neat and tidy and add a splash of colour with the Harbour housewares small hangers, made from wood with a stainless steel hanger for extra strength. Available in a variety of colours, why not mix it up and order a selection of colours. Keep your little ones wardrobe neat and tidywith the Harbour housewares small hangers, made from wood with a stainless steel hanger for extra strength. Stylish and practical solution for a neat and tidy wardrobe. Keep your little ones wardrobe neat and tidy and add a splash of colour with the Harbour housewares small hangers, made from wood with a stainless steel hanger for extra strength. Stylish and practical solution for a neat and tidy wardrobe. Keep your little ones wardrobe neat and tidywith the Harbour housewares small hangers, made from wood with a stainless steel hanger for extra strength. Available in a variety of colours, why not mix it up and order a selection of colours. These Harbour Housewares Coat Hangers are beautifully manufactured with a sleek painted finish you can't go wrong. 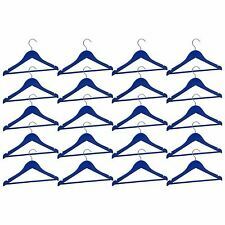 Multi functional hanger can be used for suits, shirts, trousers and dresses. 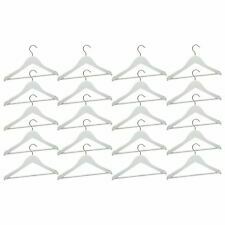 Multi functional hanger can be used for, suits, shirts, trousers and dresses. A natural quality beech hangers. TROUSER BAR SET. 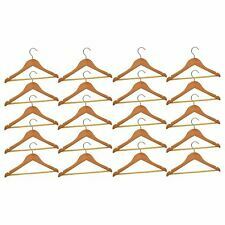 10 x WOODEN COAT HANGERS SUIT. It does not however give you the right to try out the goods. Has it been left outside your house in a safe place in case if the parcel was big for your letter box?. 10 Multi Colored polyresin balls Hooks. clothes on these multi coloured hooks. Fits Standard Door Widths. Fantastic non-slip cascading baby/toddler clothes hangers - with hooks for space saving design. Color: Blue. • Velvety smooth flock finish. • Velvety surface prevents clothes from slipping. • Increases your usable wardrobe space. • Integrated accessory bar for ties, belts and scarves. Velvety smooth flock finish. Velvety surface prevents clothes from slipping. Information Centre. Increases your usable wardrobe space. Consists of end grooves for ladies to hang their skirts. Ultra slim, space-saving.